A survey of 255 employers by the nonprofit National Association of Worksite Health Centers found that in an effort to control rising health care costs, employers are increasingly turning to onsite and near-site health care clinics. These clinics provide easy access to medical services and improve employee health, which ultimately leads to increased productivity. The survey found the greatest return on value among employees who experience high emergency room use for non-emergency conditions or have low utilization rates of existing primary care resources. Essentially, for employees who don’t often go to the doctor or tend to visit the ER when they need medical care, onsite and near-site clinics allowed them to receive treatment that was high quality and cost effective. Employers offering clinics are seeing enhanced integration of health management services, higher employee engagement in health management programs, and increased effectiveness of health promotion efforts. A majority of respondents said the financial objectives for their onsite clinics are being met: 64% reduction in medical care costs; almost 70% reduction in time lost by employees leaving work to see outside medical providers; and 63% reduction in the use of the emergency room. Acute care, emergency or first aid, and prevention and wellness are among the top services offered at employer clinics. More than 30% of onsite clinics now provide primary care services, and this number is expected to grow in the future. Nurse practitioners/RNs and physician assistants are the main providers for these clinics. Johns Hopkins’ own on-site clinics have demonstrated that they significantly reduce out-of-pocket medical expenses, transportation costs, and out-of-work time while delivering quality-driven health care to tens of thousands of employees across the United States and maintaining an historically positive return-on-investment for their employers. 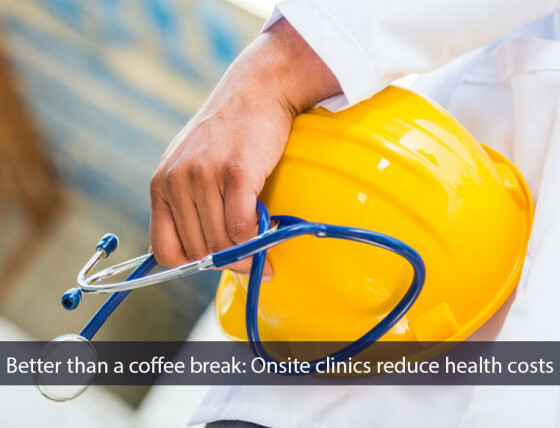 Click here to learn more about how onsite clinics reduce health care costs while providing high quality care.